5 brothers, 1 sister (current show line-up). 27 years playing music together in Branson. 7,000 concerts for over 6,000,000 people worldwide. Longest running, most successful first generation show in the history of Branson, Missouri. Set the SOLD OUT record in Branson with 80 SOLD OUT shows last season. The Haygoods grew up in humble beginnings in the backwoods of Boerne, Texas. 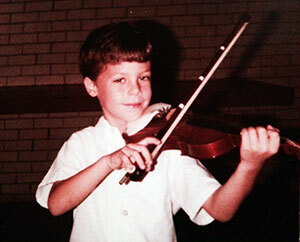 In 1983, at the age of 5, the oldest brother Timothy was watching “Sesame Street” on PBS and world famous violinist, Itzhak Perlman, was performing on the show. Afterwards, Timothy was inspired and begged his mom to get him into lessons, so Mom Haygood enrolled him into classical violin lessons. 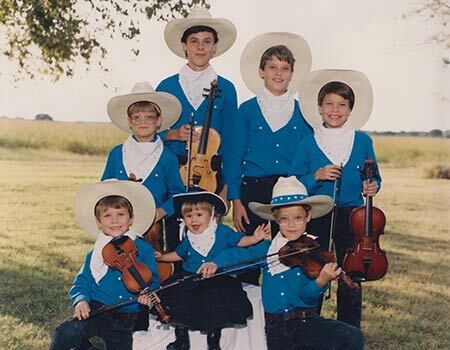 Timothy’s brothers grew up watching him play the violin and they wanted to be just like him, so they began learning the instrument as well, except for Patrick who chose the marimbas as his instrument. 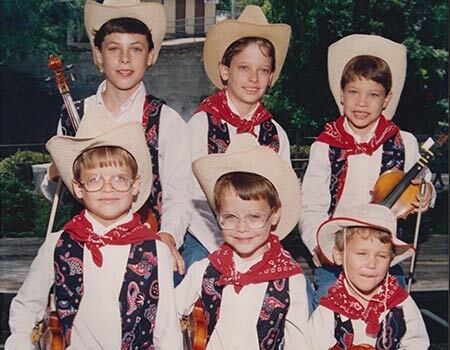 In 1987, Timothy began taking country fiddle lessons from famous Texas fiddler Frenchie Burke. Pretty soon the Haygood kids were singing in harmony, playing fiddle tunes, and dancing as part of the act. As children, they played music and sang at festivals and fairs across the Southern United States. 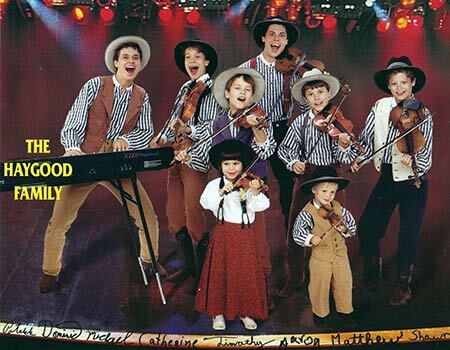 In 1993, the family moved to Branson, Missouri and began performing daily shows at Silver Dollar City. For eight years, the family grew up at the theme park, performing six shows a day, six days a week while taking music and dance lessons as well as completing schoolwork. The drive and persistence of oldest brother Timothy resulted in the family show becoming the most successful, highest rated show in the history of Silver Dollar City. 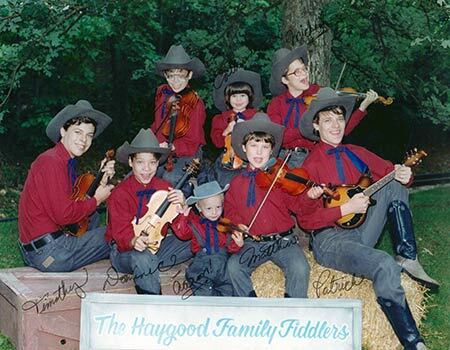 The Haygoods completed over 6,000 shows during their time at Silver Dollar City. 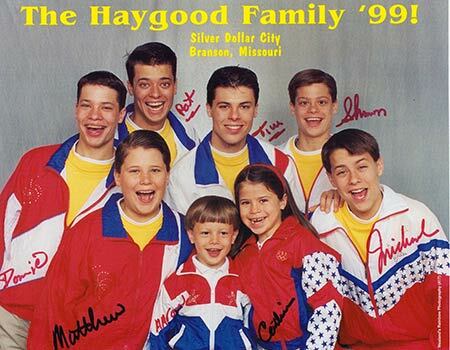 With a generous loan from Grandma and Grandpa Haygood, The Haygood brothers took a giant risk and opened their own show on the Branson Strip in 2001. The move from a theme park to town was more than a location change, the three oldest Haygoods also took creative and financial control of the show and began to make their mark on the show and music scene. 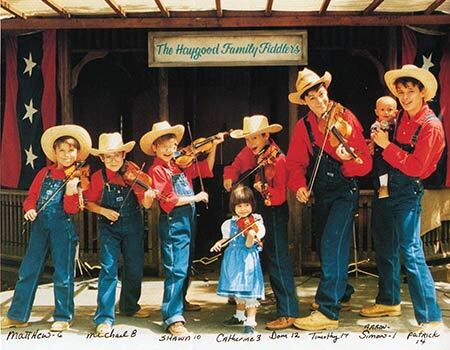 The Haygoods became the youngest performing family in the history of Branson to ever open their own show on the 76 Strip. At the end of a tough first season, The Haygoods had to make the decision to push ahead despite financial hardships or to give up the music business and lead “normal” lives. The choice was clear and they set out to make their show the most exciting on the Branson Strip. With Dominic as music director, they began to take classic songs and put their own musical twist on them. Familiar songs were updated with modern dance moves and unique harmonies. At the same time, the always energetic Haygoods began reclaiming their childhood by filming their wild BMX and paraplane stunts which made them a YouTube sensation. 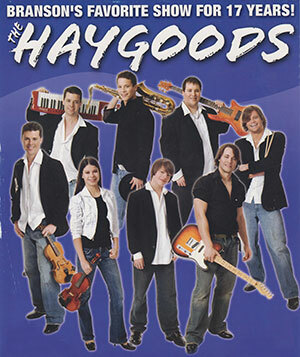 In 2009, The Haygoods set about creating their own original music with the hope of reaching a national audience. Daily jam sessions and boxing matches led to recording studios and bringing in producers to help refine their music. Their first album “Leaving It All Behind” was released in 2010. Without any radio support, record label support or even digital downloads, the album sold over 10,000 physical copies in its first two months of release. It went on to sell over 100,000 physical copies without any radio support at all. In 2011, a huge change occurred in the show and brothers Aaron and Shawn both left to pursue careers outside of music. The brothers leaving the show was a monumental change for the remaining siblings but the parting of ways was amicable and understandable. Both Shawn and Aaron continue to pursue careers outside the music business today. In the fall of 2011, The remaining six Haygoods took two very big steps in their careers, they teamed up with the RFD-TV Network, a cable channel distributed in over 50 million homes in the USA and many more worldwide, to create a reality/music television show. In addition, The Haygoods also agreed to move the live show to RFD-TV The Theatre, also in Branson, on the famous Highway 76 Strip. The television show called “Adventures of The Haygoods” did extremely well on the RFD-TV Network and garnered very good Nielson ratings, especially for a completely unknown show. During the winter of 2011, The Haygoods toured throughout China playing 30 shows in 20 major cities in under 35 days. The Chinese people loved The Haygoods so much that a security detail had to be assigned to them for their own protection! The Haygoods remember the China trip as one of the greatest adventures of their lives. 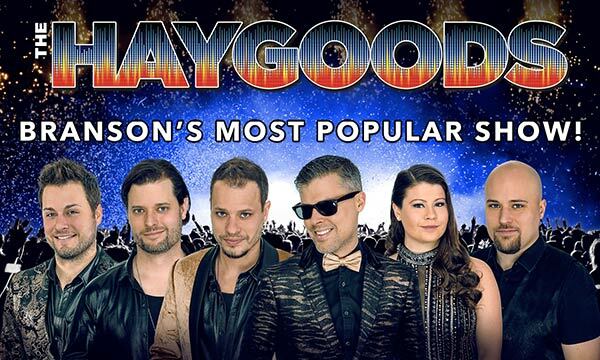 In 2012 and 2013, The Haygoods became the longest running most successful first generation show in Branson, Missouri and celebrated with a SOLD OUT 20th Anniversary Show with over 2,200 in attendance. In 2014, The Haygoods moved their show and partnered with The Clay Cooper Theatre to build a brand new show experience, unlike anything ever seen in Branson. This show became incredibly successful with a phenomenal run of 62 SOLD OUT shows, setting a record in Branson. In 2015, The Haygoods partnered with international star Barry Williams of The Brady Bunch fame to create a National TV show called “A Very Barry Branson.” This TV show explored Barry’s journey to Branson from Hollywood with The Haygoods assisting him in establishing his show in Branson, while also teaching him the country lifestyle along the way. This show premiered on the GAC Network in February of 2015. The success of the television show on GAC led The Haygoods to complete 72 sold out shows in Branson in 2015! In 2016, The Haygoods kicked off their 24th season in Branson and once again set the sold out record in Branson for the most sold-out shows in one season with 72 SOLD OUT SHOWS! In 2017, the Haygoods celebrated 25 years of performances by selling out over 75 shows in Branson! The Haygoods also released a second original music album entitled “The Lucky Ones” which was downloaded over 50,000 times on the internet resulting in music videos watched by over 200,000 fans!! Also, The Haygoods began taking the show on the road performing sold out shows in Dallas Texas and St. Louis. In 2018 The Haygoods launched a new show experience and performed a full roster of 135 shows in Branson, Missouri selling out an incredible 80 shows! The Haygoods also took the Christmas show on the road selling out in Bartlesville OK, St. Louis MO and St. Joseph MO. The Haygoods spent an entire year in the studio as well recording their 3rd album of original music set to be released in Spring 2019. The Haygoods spent the winter of 2019 working on a brand new show experience, once again reinventing themselves, adding more state of the art special effects, more routines, more music and more of what has made them such a long term success for their 27th Season in Branson. The Haygoods also plan on extensively touring in 2019 and are currently booking dates. Watch for more news! The Haygoods have been incredibly blessed by fans all over the world and continue their epic run of shows into the foreseeable future. Thank you for being a part of The Haygood experience today! God Bless!